LAX police released these images of Shion Isimel, who was last seen in Terminal 5 on Monday, Aug. 3, 2015. 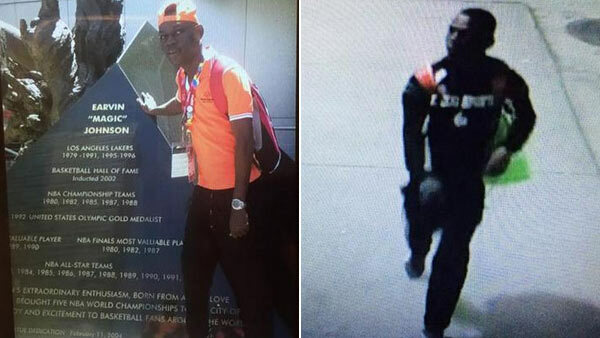 LOS ANGELES -- LAX police are searching for a missing Special Olympics athlete from Cote d'Ivoire on Monday. Shion Isimel, 15, was last seen in Terminal 5 around 6:20 a.m. He was reported missing by a Delta ticketing agent. Authorities say Isimel has autism. He was last seen walking toward 96th Street away from the airport. Isimel is 5 feet 8 inches tall and was wearing black sunglasses, black pants, and an orange shirt with Special Olympics in white letters. He speaks French but does not speak English. Police say Isimel's team has already left.